I once fell in love with a rope bowl, it was by David Stark for West Elm. Sadly that awesome rope bowl is no longer available, bring it back, bring it back I say! My latest crafty project was inspired by that bowl and I believe has something to do with my fixation on neutrals with layers of texture. In fact, I think I need an entire Pinterest category devoted to it. 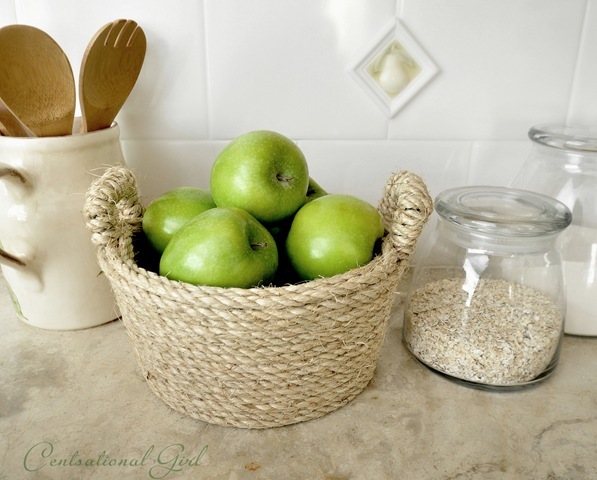 I’ve had that rope bowl on my mind for many months, so I snagged a cheapo metal bowl from a craft store on clearance a few weeks ago, plus a couple of rolls of sisal rope from my local hardware store, and then got crafty with my glue gun. Grab yerself a vessel, whatever you like. Aluminum handled bowls like this speckled one (reowr) work great. 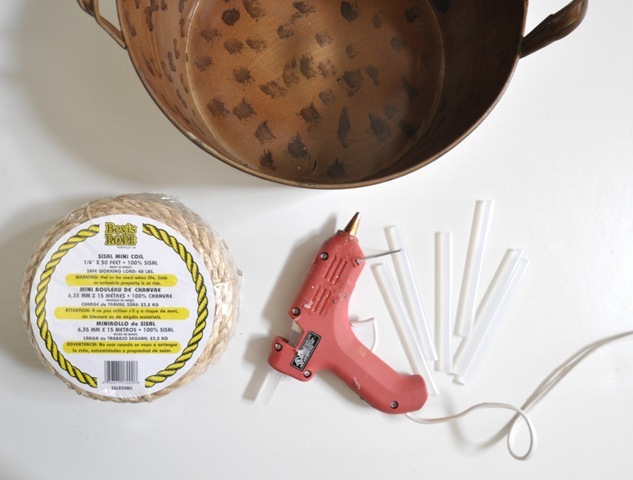 Also grab a dozen glue sticks, your trusty hot glue gun, and 50 to 75 feet of sisal rope (mine was ¼ inch thick). 1) Start with the handles, gluing the first part of rope in place. 2) Finish each handle wrapping the rope as shown, hot gluing every second wrap around. 3) Begin the outside of your bowl by securing an end of rope under the handle, then keep gluing the rope all the way around. 4) Finish your bowl off by wrapping the rope around the inside. You determine how far you want to go, all the way around the inside or half way, it’s up to you. Or whenever you run out of rope . . .
And there you have it, in less than an hour, a sisal rope bowl to call your own. Both textural and versatile, rope bowls are a catchall for anything from fresh fruit, to bills, to your collection of quirky matchbooks. Set me loose with some sisal rope and a glue gun on a galvanized bucket or a cake stand and we’re talking about even more rope fabulousness. Sisal rope is your crafty friend. Got a recent rope project you’ve finished? Go on and share it! Impressive and so cute!! I like that this did not take forever to make..I want to try this! That looks great…personally, I think it looks better than the David Stark one! Such a cute bowl with great texture and a neutral color that can go anywhere. I’ve said it before and I’ll say it again…..some people are uber talented (you) and some people wish they were! (me). This is amazing. I’ll be honest and say I’ll probably never make one. Sure I’ll buy the rope and the metal container and I have a glue gun. But hoarding the materials and saying I’m going to make something is usually where it ends. Thank goodness for blogs like yours so I can at least look at something awesome! Every time I think that you can’t possibly get anymore amazing, you go and do something like this. I love it!! Totally love this! I’ve seen a few of the rope bowls before but I really like the handles on yours. It looks amazing! Thank you so much for ending my craft rut! I just haven’t seen anything out there that’s really gotten me excited in a while. I totally love this! Now I have a project to look forward to! Thanks so much for sharing! Great job Kate! Yours is much better than David Stark’s. I love the rope wound handles, really makes the project. Thanks so much for sharing this! Love this! I have a weakness for anything covered in sisal or jute. I just love that natural texture! And I agree that yours is much better than the David Stark version. Oh crafty friend, I need you around a mirror. For some reason I’ve had sisal on the brain too! Thanks for pushing me a little closer to the glue gun! I love this. So simple and unique. I’m bookmarking this page. You never cease to amaze me! I wish I can borrow your creativity for a day. I like your bowl so much better than your inspiration bowl! I’ve been thinking of wrapping a brass lamp in some sisal rope, and now I think I will! Thanks! Wow, looks great! Neat idea! ps-I posted our master bath makeover today. Would love for you to see! It’s going to be featured in Cottages and Bungalows magazine! LOVE this! I’m a texture fanatic, too, as most of our house’s backdrop is neutral….will definitely give this a whirl. Lovely rope bowl. Thanks so much for sharing. I can’t wait to give it a go. New follower from Tip junkiie. You made this look so easy… Anything with sisal rope would look great in our dining room where I have a minimal beachy theme going. I might have to try this sometime…I’m also thinking it would look cute wrapped around a picture frame. This is just another reason why I NEED to buy a glue gun. i’ve been doing without one for too long. Thanks for the inspiring rope bowl tutorial. I’m already thinking of all the things I could wrap! Haha. I think a planter would look cute for my balcony. LOVELOVELOVE. I’m off to the craft store for some rope! What a great idea! I am sure I have all of those items on hand here at home, I am going to try that one! Thanks! Oh my gosh, I love this…I may just have to go out and make one! Wow! Wow! Wow! Does that say it all? =) You’re an inspiration. What a great crafty idea! I have the bucket and glue gun. Now jute is on my shopping list! I guess you haven’t had trouble with any oil-stink? The only sisal rope I’ve been able to find in the hardware was treated with oil (apparently it lets them eke out a few more feet from the raw material), and stank to high heaven even after washing it several times. Did you actually find an untreated sisal rope, and if so, what brand was it? YES!!!! Love it kate! I did the same thing to my son’s Ikea light fixture. Sisal rope is your crafty friend! Love it! I want to try this soon! Too cute! Looks very nautical, and I heart nautical!! wow. love the idea. will use it. I love it! What a great idea. I may have to try this with my kids. I think it would be nice for them to have a basket like this in each of their rooms for books. OMG i am in LOVE with this basket. soooo simple and adorable. i am making. and will share on my blog ;) thanks for the tutorial. Love, love, love it. I need to make me one of those! Gosh I wish I would’ve seen this project on Friday. It would have been perfect for my nautical/beachy party over the weekend. I had the rope and all. Love this – I am totally doing it! i have one like this that i made sitting on the counter! i also made placemats and coasters. so much fun and so simple! what a great idea! ive done this to a couple of vases. this looks great. loveit! Your bowl is just wonderful, I love the texture of rope. Funnily enough I have just finished a rope vase project . I think your bowl and my vases would look great together…what do you think? What an awesome idea!!! it looks so good in your kitchen I might have to make one for my new kitchen!!! Wow – I am so impressed! What a great job you did! Super cute! I did something similar with jute string around my old pillar candles. I like your thick rope better! Looks wonderful, Kate! I love the texture of sisal rope. I used sisal rope on candles last year and gave as Christmas gifts to the neighbors. You never fail to amaze me. It looks beautiful! Awesome idea! I even added it to my DIY board on pinterest!! I think I have a flower pot around here that could use some roping…. I love this! Perfect hack! You come up with the best ideas! It looks perfect! I really like it! Love this! 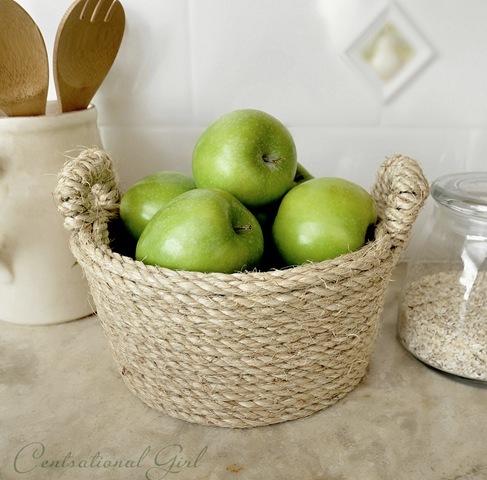 I am not a traditional basket kind of girl, but I could totally use a rope bowl. I am adding this to my project list for the weekend. I am thinking about making one and then spraypainting it a bold color. Thanks for the inspiration!!! I just came across your blog and I love it. I wish I had seen this post a few days ago because I just bought a new fruit bowl and while I like it, I like this one a lot more! genius! totally in love with this idea! must try for myself! ;) thanks! Love it! If only I could use a glue gun w/o roasting the tips of my fingers. Love how fantastically easy you make this! Such a sweet and pretty DIY project, can’t wait to give it a try! this is sooo amazing…beware any plain, boring buckets in my house! i did make some hanging planters with sisal rope leftover from my daughter’s cowgirl birthday…come take a peek! Love this! You are one crafty bi-atch! So awesome you are. i jsut wanted to let people thow that there are alumnium buckets at Target for sale for %90 off in the seasonal department. This project would make them great!! Each bucket ended up costing me 20 cents. I love it! I’ve had that same West Elm bowl on my inspiration board for a while now. One of these days I will get around to making my own! Wow!!! Such a great idea for mothers day!!!!!! Thanks for sharing! just got here bia knock-off decor….your rope container is heads over tails waaaaaaaaay cooler than the west elm bowl. if those two were sitting side by side….i’d choose yours over theirs in a minute. honest to peanuts….this is amazing. and i’ll bet you’ll find far more use with it than the other bowl…which looks a bit….well, tippy/tipsy. stuff would fall all over and out of that thing. your stuff is going to stay snug and secure and look adorable in your bowl/bucket. great work! I sisalled (is that a word?) my Ikea pendant lamp. check it out! I really, really like this! Now I can’t stop thinking what I can ‘sisall’! This is a MUST MAKE! Love it! Thank you for sharing! Would be such a great summer hostess gift!! I love, love, love this! i recently updated a pair of yard sale lamps with jute string wrapped around the bottom and top of both shades. it added just the touch of texture that i was looking for. i so need to make this bowl now! Kate Your bowl came out wonderful. I love working with sisal and other natural ropes, like twine. I make kitchen utensil jars with sisal rope and sharks teeth. It adds such a great natural texture to the kitchen. I also make sisal decor balls. 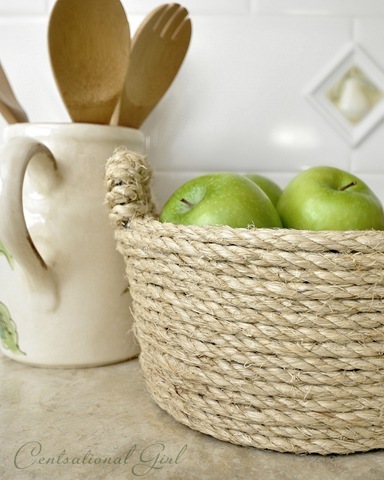 I just love the nautical touch a little sisal rope can bring to any object! and it doesn’t mind getting wet! 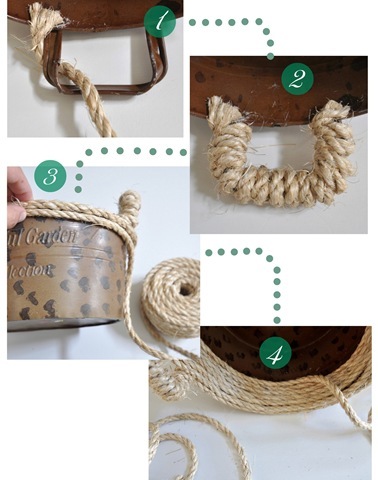 I use jute twine all of the time but I love the idea of rope!!! Thanks for the inspiration! This is a wonderful, versatile idea. I am thinking Christmas gifts! tooo cute!! and what a great idea for Christmas! Tks for the creative idea! I used this rope to make a scratching post for my cats. I just wound it around a 4 by 1 (about 20 inches long). It’s much more durable than the cardboard ones that you spend a small fortune on. It came out great, and the cats LOOOOVE using it. It’s over a year old, and still looks new. i found this on pinterest… and i LOVE it! i am craving some craftiness this weekend and i think it is the perfect replacement for my current fruit bowl. i will definitely give you credit if and when i make it and post it to my blog… thanks for a great tutorial! Love, LOVE, love this!!! Thanks for posting!! Great project! I’mgoing to be keeping my eyes open for a metal bowl on the cheap so I can do my own! I bought sisal from Lowe’s and it had an unpleasant smell, similar to gasoline. Any suggestions on how to get rid of the smell? or where to buy sisal that doesn’t smell? Looking at this pot reminded me of a big terra cotta pot I covered with rope in the same fashion and added a big fluffy paper flower in a matching color. I have used it for a flower pot cover, made arrangements for it and loaned it to my co-worker for fall table decoration last year. And I’ll be darn if I know where it is!!!! I do you I coiled the rope 2 or 3 rope on the bottom to protect furniture and the floor! Thanks for the reminder, you bet I will be looking for that pot!!! Im going to make this tomorrow using the box from my daughter’s diapers and wipes. Thanks for the inspiration! What a great idea! Thanks for the tutorial! This project is definitely on my list to do this winter. I’m hosting a craft night project link party – I would love it if you would link up this project! You have turned me into a DIYer! Love, love, love this! Love the nautral and this outside of the box idea. Love your blog too and I am your newest follower! Hi Bev, I think you’d be better off wrapping a glass candle, I would hestitate to wrap just a wax candle in sisal, yes that is a fire hazard. I wraped the bottom of a glass lamp. I no longer have it. Gave to my sister-in-law who was doing her boy’s room in a cowboy theme. I thought, I’ll find another lamp and make another, just never have. It really looked great. Just another idea. What a great idea ! Could you paint or stain it ? I can’t wait to try it. Really love this, it would match our kitchen perfectly too! Saw this at a craft fair in Arizona three years ago. They had all different shapes, sizesand designs. Only used only rope and glue guns, no base shapes. Still very solid and beautifully done.